This week I deleted my Tinder account because, you guys, I've met someone. His name is Zambeze and he's the gosh-darn cutest boy you ever did see. 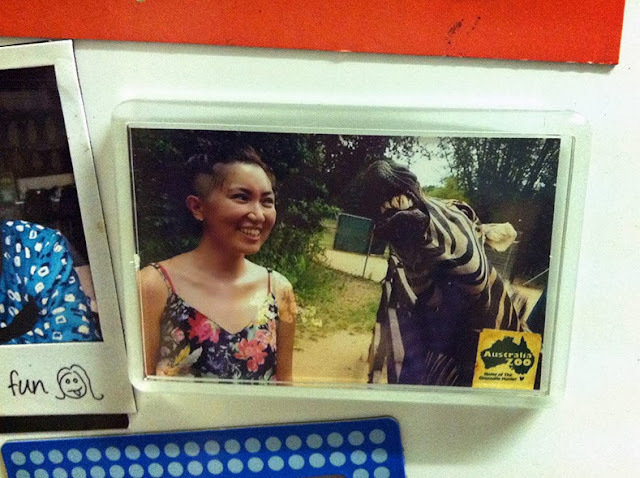 We met at Australia Zoo and it was love at first sight. Did I mention he's a zebra? Australia Zoo's zany zebra encounter is the only one of its kind in the world. Zebras are renowned for being adorable to look at and so aggressive up close. However, there's always an exception to every rule. In this instance, his name is Zambeze. He is one cool, super chill dude who, as you can see, enjoys a laugh. Zambeze lives in the Australia Zoo Africa enclosure with two other male zebras - one who's desexed and has become the other stallion's lady-boy. They knew he was chill enough for human encounters because he gets along fine with the other stallion. If you go and visit them with the giraffes and rhinos, you'll see that little Zambeze is smaller than his friends and is happy to graze ALL day long on his own. I was told by the keepers that the Zebra Encounter is not as popular as the other animal encounters. Maybe because they're shaped like mini-horses or giant ponies but these beautiful creatures are stunning to look at, fun to hang out with and gorgeous to pet. Well, I'd only recommend petting Zambeze - others are a look but don't touch type. The best part is all profits from any Australia Zoo activity goes right back into helping animals and conservation. Zambeze is my boyfriend and all but I don't mind if you visit him for a friendly feast and laugh.